If you're a beginner, you simply can't afford to miss a mate in one if you want to improve your chess. 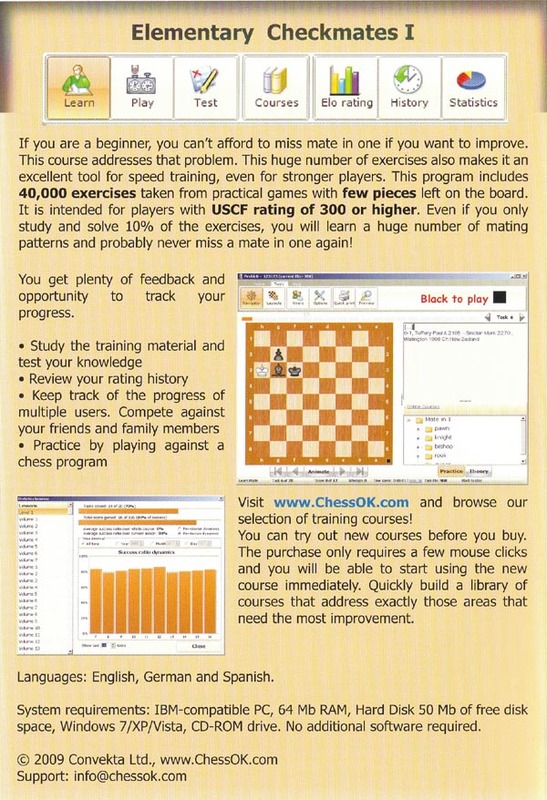 This comprehensive course, developed by the chess experts at Convekta, addresses this problem. With over 40,000 exercises, it is also an excellent tool for speed training with players of all skill levels. Even if you are only study and solve a small percentage of these exercises, you will learn a huge number of mating patterns and will likely never overlook a mate in 1 again! The exercises contained in this instruction program only have a limited number of pieces on the board, making it ideal for those still learning the basic checkmate patterns. System Requirements: IBM-Compatible PC, 64 MB RAM, Hard Drive with 50 MB of free space, Windows 7/VISTA/XP, CD-Rom Drive. No additional software is required. IBM-compatible PC, 64 Mb RAM, Hard Disk 50 Mb of free disk space, Windows 7/XP/Vista. No additional software required.